Sarah's Just Not That Into You! Yes, I mean you. You know who you are. You point out whenever Sarah Palin tells little harmless white lies. You call her names like "the Quitter Queen." You ask tough questions that get her all discombobulated, like, "What newspapers and magazines do you read?" You post pictures of her on your blogs that show what she looks like without makeup, for crying out loud! And you even investigate her past when we all know there is only one real unfiltered version of her history that she's already laid out for you in her new book, "Going Rogue." No wonder she banned you from the last stop on her book-signing tour. How dare you think you could invade her space right there in her beloved Wasilla. Sheesh! Three things struck me about this picture right off the bat. Then there's a veritable wall of mesh netting hanging from the ceiling all the way down to the lower floor, serving as .. ? .. a tomato-proofing curtain? I realize this is a space where people play sports that involve moving objects like basketballs and hockey pucks. But is this netting necessary for crowd control? Or is it just to add to the sense of special-ness one feels as one reaches the upper level and grows close to the precious one? I guess it could be to keep Sarah from throwing herself over the edge of the railing to fall into the arms of her devotees below. But back to the event itself. Turns out there's not one but two reasons that certain people were escorted out of this public (as advertised by Sarah in a recent tweet) event. First, someone drew up a list of people to be banned and provided names and photos for the reception desk at the Sports Center. I wonder who that could be? Sarah won't take credit for the ID package, claiming that Harper Collins (publisher of "Going Rogue") was responsible. But who here believes Harper Collins determined that a blogger (Gryphen of Immoral Minority) and a videographer (Dennis Zaki) should appear on a "banned" list? Second, according to Wasilla Recreation and Cultural Services Manager James Hastings, he didn't want to be responsible if Sarah's minions created "a negative situation" for our intrepid blogger and his photo-journalist friend. "If I take three minutes on Google I can see that, given the nature of the people who were here, it wasn't in his (Zaki's) best interest to be here. 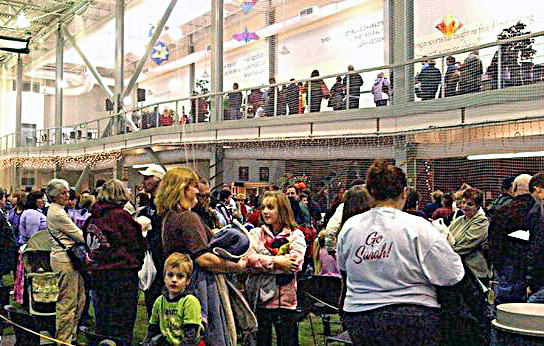 He and others could have found themselves in a negative situation," Hastings told ADN. That admission alone says tons about Hastings, Wasilla Palin-worshippers, and of course Sarah herself. But we already knew that. Sarah, just between you and me, hon, you've gone as far as you can go in public life. But it sure is fun to watch you try and pretend otherwise. Now, can I be banned too? Please? The media knows when someone is a celebrity. 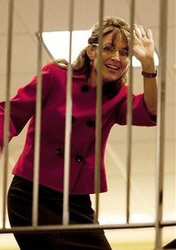 They rightfully labeled this picture, "Sarah Palin waves at fans during book tour." I don't think religious figures in history had fans. I don't think monarchs had fans. Even politicians don't seem to have fans. But musicians do. Television, movie and stage stars do. Some professional athletes do. But not Senators or Representatives or Mayors or Governors or Presidents. But that's neither here nor there. Bottom line is, Sarah Palin has fans. Fans who wait in the cold for her plane to touch down, wait while she switches to the big blue bus parked on the runway, wait while the bus drives a few miles to the local bookstore, and wait while she regally disembarks the bus, clutching Trig (the token child) like a security blanket and her personal pro-life badge, and wait while she enters the bookstore for "The Amazing Signing Ceremony." Fans of Sarah Palin, I know you are out there. I doubt many of you frequent my blog but I have a very serious question to ask you, and I would really, really love to get an answer from some of you. But before you consider the question, you have to promise to think about it and then be as honest as possible with yourself, with me, and with my other readers. If you found out that Sarah Palin told a lie and continued to perpetuate a hoax about giving birth to a Down syndrome child, would you still be a fan? Even if you who read this have absolute adoration for Sarah Palin (if your minds are at all free to think), you should be able to imagine the scenario. I'd be very happy if you left a comment on how that might change your perception of her. Would that totally destroy what you think of her? Partially destroy? Would you forgive her this kind of fraud if it occurred under certain circumstances? First of all, a very sincere mea culpa to those who visited my blog and who had, by every right, an expectation that if I took a break I would at least say something about it. I have no explanation for my absence that would hold water... suffice it to say I blew a gasket and skittered off for several weeks in random wanderings, unable to give voice to any of my opinions or feelings. Second of all, were it not for Tiger Woods and the daily revelations of his dalliances, I expect we'd be hearing even more inane coverage of Ms. Inane herself. Yes, the self-appointed Queen of the North, the female Jesus (Jesusia?) who loves to cry that she is being crucified by the press and her former close friends and co-workers, and frankly, most of the world. Thank goodness for the steadiness and reliability of the Alaskan bloggers (you know who you are!) and even some not-so-Alaskan bloggers and journalists for debunking Ms. Rouge Renegade at nearly every step of the way. Third, by this post I'm not quite sure that "I'm back..." -- but at least I'll try not to leave you hanging as before. Nothing ill beset me in such a way that I felt warned off my usual blog-course. Ha.. as if I'd made such a dent in anyone's usual deception! I wish. I thank the many of you who worried and questioned, though. It was humbling to receive your e-mails and comments. But I do sense that we all need to do what we can, again, to gather up the steam needed to melt the mask off Ms. S'error so that there is no chance, whatsoever, of seeing her name on a ballot for our national leadership. Ever. Again. Thank you for your patience with me, and for keeping the faith. Now, let's get busy!